As the owner of a commercial property, it’s important to protect the value of your investment. This means ensuring the property is in the best shape possible, not only for yourself but also for the satisfaction of those who may be renting space from you. Whether your own a warehouse, office building, or multifamily apartment complex; having a properly installed roof can make all the difference. Your commercial roofing system not only protects the build itself; it protects everyone, and everything, inside of it. When you contact the team at John Beal Roofing, we’ll schedule a time to visit your commercial space and assess the needs of the project. Is this project the result of damage or was it simply time for an upgrade? The answer to this question will play a role in what work will need to be done. While visiting your property, a John Beal contractor will examine the surface of your roof, as well as your entire property. We’re not only be looking at the building itself but the surrounding area, as well. We’re always trying to think ahead to any problems that could arise in the future, noting any possible complications or hazards we might find. If we see something that has the potential to affect the lifespan of your roof, or its installation, we’ll provide you with these notes upfront. Choosing to have new commercial roofing installed on your building is a big investment, so we want to make sure that you have all the information you need to make an empowered decision. After assessing your commercial roof, we’ll sit down with you to discuss the specific goals or objectives you may have for your roofing project. 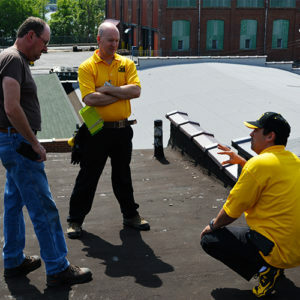 At John Beal Roofing, it is always our preference to work closely with customers. The more we know about your needs, the better we can meet them! We’ll talk to you what roofing solutions are best for your space, as well as what’s best for your budget!! We’re certain that with our expertise, we can find the perfect solution to any commercial roof! Once our contractors have an understanding of your property, along with your budget and business goals, we can dive into the specifics and make recommendations on which commercial roofing system might serve you best! There are a variety of different roofing options for commercial properties, so it’s important that you understand the Pros and Cons of each. Your experienced John Beal contractor will make certain that you do, acting as your guide. With a roofing material chosen and your commercial property assessed, your John Beal Roofing contractor will then provide you with a FREE estimate. We provide every one of our customers with a quote, backed by our John Beal Low Price Guarantee! Our word is our bond: if you’re able to find a cheaper estimate of equal value, we’ll match it! If we can’t match the quote of our competitor, then we will pay you $100! See offer to learn more about our John Beal Low Price Guarantee! If you’re ready to get your FREE estimate and learn what commercial roofing solution is right for you, contact John Beal Roofing today!